When we were choosing a destination for our big family vacation this year there were several locations that came to mind. We wanted a vacation that was diverse in what we would see & do but was also budget friendly. After giving it some thought we decided we would visit New Mexico. We had visited the mountains of New Mexico previously but had never explored other areas of the state. Since this would be a road trip we would cut across western Texas which we had never explored either. This would be a new adventure with a mix of familiar territory as well. Our trip would last 10 days and we would visit the the lowest depths to the highest heights imaginable. 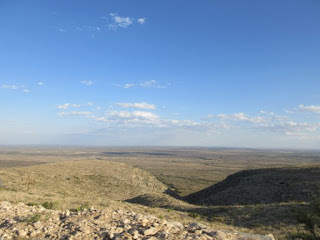 We spent two days in southern New Mexico in Carlsbad & Roswell. 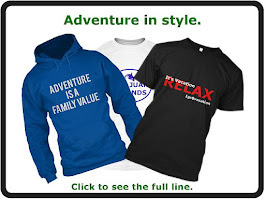 If you are looking for a weekend getaway, this is a great adventure for the budget conscious family. New Mexico is a much less expensive destination than say Colorado & you have many of the same activities from which to choose. The first day of our trip was in Carlsbad. We arrived in time to have an early dinner & then we were off to Carlsbad Caverns National Park. That evening the park was having two special events - the bat flight program & the star party. 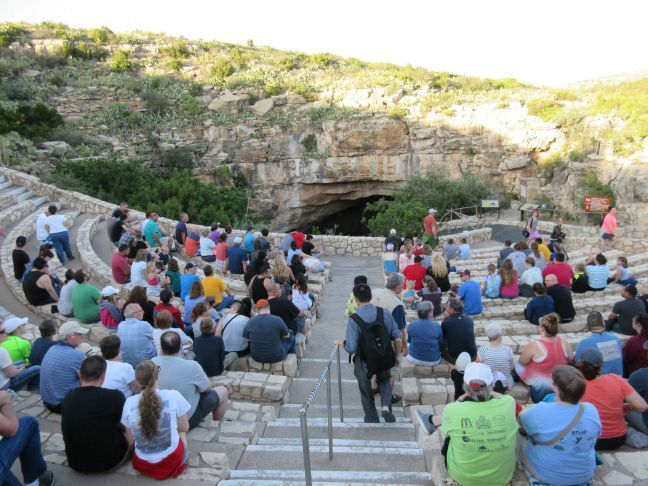 The bat flight program in the amphitheater is a nightly event that takes place from mid-May through mid-October where thousands of bats exit the cave at around sunset. Prior to the bat flight a park ranger has a program where visitors can learn about the cave & bats that inhabit it. The bat flight was absolutely mesmerizing and well worth seeing! We watched the bats exit the cave until after sunset. We left because it was growing difficult to see the bats exit but they were still exiting! To learn more about the bat flight program click here. Bat program at Carlsbad Caverns National Park. After the bat flight program the star party began. In the east parking lot, local amateur astronomers set up their powerful telescopes for the public to use to see the night sky. The telescopes were so powerful that you could see the actual rings of Saturn. The star parties are offered once per month between the months June & October. To learn more about the star party you can visit the National Park Service web page. 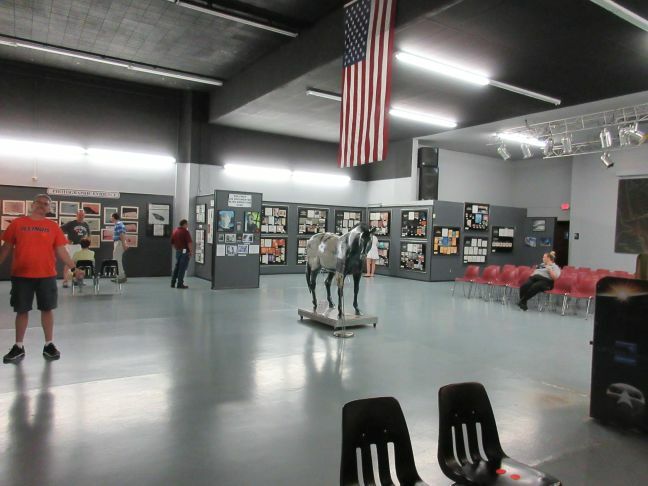 Admission to the bat flight program & star party was FREE! This unique adventure is one your family will not soon forget & it does not cost a dime. The next day we got up early & headed back to Carlsbad Caverns National Park to tour the cave. The seven mile drive into the caverns from White City is beautiful! The park road had many switchbacks that have amazing views! We arrived at the cave by 9 AM & purchased our tickets. The cost for admission at the time of our visit was $10 for adults aged 16 & older & FREE for children 15 & under for a 3 day pass. You can find visitor center hours information here. Times vary based on the time of year of your visit. You can find entrance fee information here. The Big Room at the base of Carlsbad Caverns is 750 feet down a 1 1/4 mile steep trail called the Natural Entrance Trail. If you or members of your family are not physically able to hike into the cave, there are elevators available. However, we wanted the experience of hiking into the cave. There is nothing quite like watching the entrance as you head in the cave. The last daylight gets fainter & fainter as you descend the trail. I wonder what the original explorers were thinking as they entered the cave? Along the Natural Entrance Trail you will find beautiful formations. The national park service has the cave lit but we brought a high powered flashlight so we could see better. If you choose to take the Natural Entrance Trail, it is a doable hike with benches throughout for those who struggle with the incline. It took us about 45 minutes to get to the Big Room. At the Big Room you will find a small cafe that sells snacks & drinks as well as t shirts etc. There is also working bathrooms - much to my surprise. 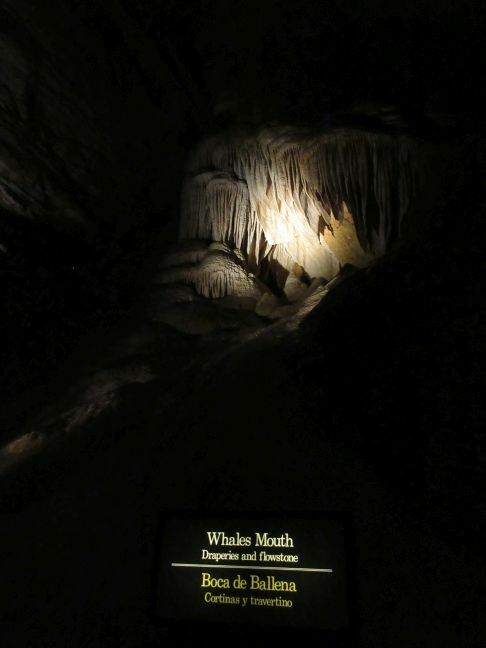 There is also a 1 1/4 mile trail through the Big Room where you can see formations such as the Hall of Giants & the Bottomless Pit to name a couple. The cave stays at a cool 56 degrees year round so make sure you bring a jacket or hoodie. The cave is very humid as well so bring your inhaler if you use one. After hiking the Natural Entrance we met our ranger for our 10:30 AM tour of the Kings Palace. I had previously purchased the ranger tour online at the recreation. gov website. The cost for the tour was $8 for adults & $4 for children aged 4+. The ranger led tours cost additional over the standard entrance fees for the park. There are several tours from which to choose, some of which involve repelling. Since this was our first cave tour, we opted for the milder Kings Palace tour. The tour is 1 1/2 hours in length. The ranger will not only tell you about the formations you will see but you will also learn the history of the exploration of the cave. At one point of the tour the ranger removes all artificial light demonstrating the complete darkness original explorers experienced. This was one of the most memorable moments from our trip. It is absolutely amazing how dark the inside of the cave was! After our Kings Palace tour we finished our tour of Carlsbad Caverns with the Big Room hike seeing such famous formations as Hall of Giants & the Crystal Spring Dome. We opted to ride the elevator back to the top because we had hiked the Natural Entrance into the cave & wanted to be able to experience both. I will say the elevator was much easier but not nearly as beautiful! When we visited the cave it was not very busy. However, I have read blogs where the cave is very busy on weekends between Memorial Day & Labor Day and there are lines waiting to ride the elevator. You can choose to hike out of the cave but there are time restrictions you must abide by. To learn more about the times visit the park website. As I have mentioned on previous blogs, I am a member of just about every hotel chain loyalty program available. Why not? I am going to stay in a hotel when I travel, I might as well earn some kind of reward right? When I stay I try to choose a hotel that has a rewards program. 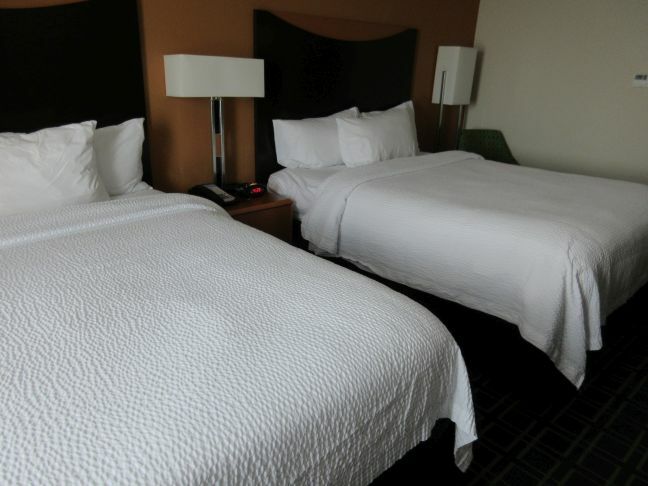 My personal favorite rewards program is Marriott. I think they have the best rewards & you get free nights faster than some of the other chains. While earning rewards is important, price also affects the accommodations I choose. So when I set out to book a hotel in Carlsbad I considered both. 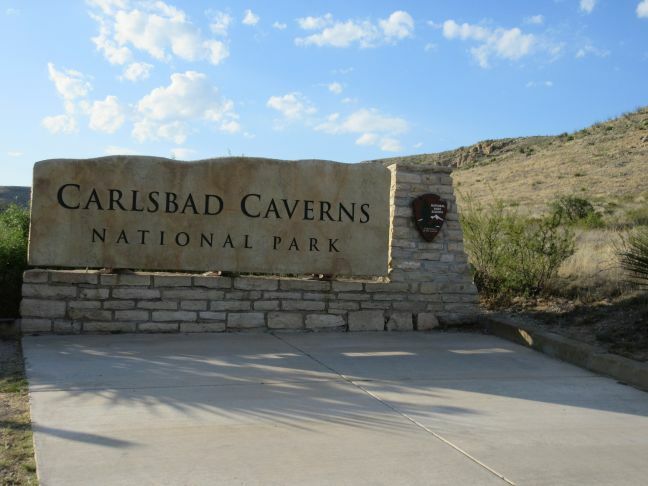 We decided to stay in Carlsbad even though White City has a Rodeway Inn & it is at the entrance of Carlsbad Caverns National Park. 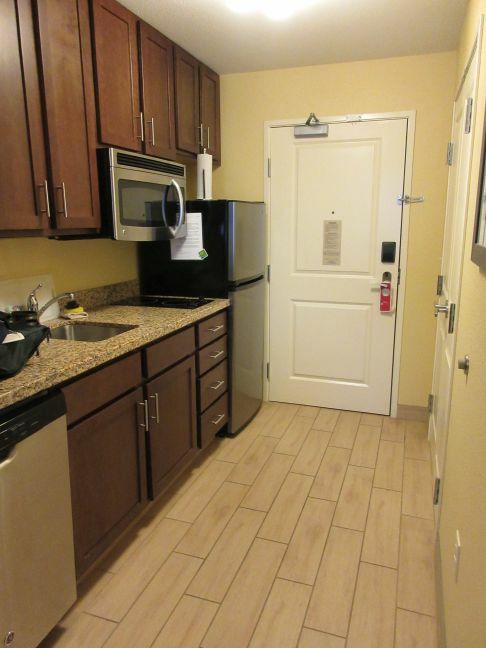 After price checking & reading reviews of other hotels including the Comfort Suites, Hampton Inn, & TownePlace Suites I selected the Fairfield Inn & Suites in Carlsbad. I booked my room 5 months prior to arrival choosing the standard rate instead of the slightly less expensive advance purchase rate on the Marriott web page. The reason I always book a room using the standard rate is because you can usually check back the closer you get to your arrival date & get a rate that is lower. This happens every year without fail for at least one hotel we stay in when travelling. The Fairfield Inn & Suites was $170 per night when I booked it 5 months in advance. However, I checked the rates periodically & about 6 weeks prior to my arrival date, the rate dropped to $120 per night. I then cancelled my original reservation that I booked using the standard rate & re-booked the room at the new lower rate. BOOM - I saved $50 & I did not have to work hard to do it! One more tip about the Fairfield Inn & Suites, the rooms are much cheaper if you can stay during the weekend. We adjusted our trip so we could stay on the weekend at this hotel instead of during the work week. 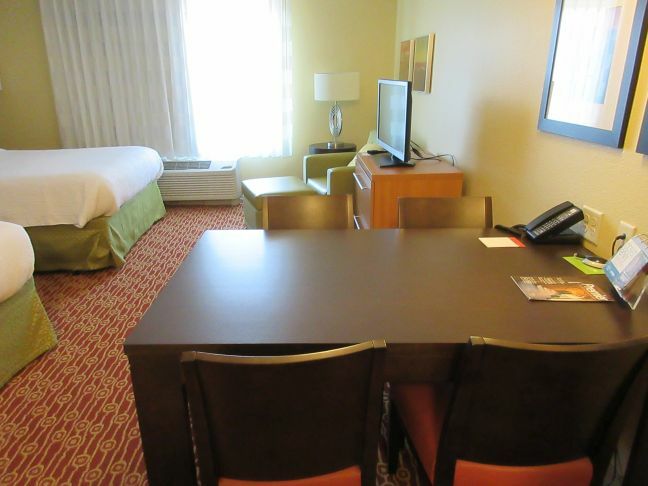 By staying on a Saturday, we saved $50 over staying during the work week. 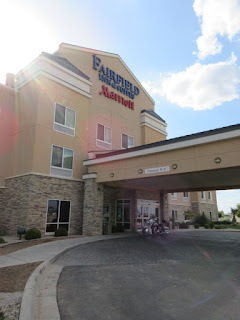 We stayed at the Fairfield Inn & Suites for one night but we enjoyed our stay & would recommend it to others. Our room was clean, comfortable, & quiet. 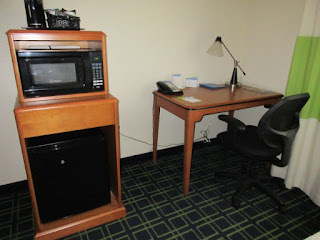 The room we stayed in had 2 queen beds, a microwave, & a mini-fridge. My only complaint with the room would be that the sink is not in a separate area from the toilet & shower making getting ready in the morning more difficult. There is a pool outside in a nicely landscaped courtyard that also features a fire pit. We did not get to enjoy the pool during our stay but it looked inviting. While the hotel was close to full, we did not hear any noise. Our room faced the street & we did not experience a problem with highway noise either. The staff was accommodating & friendly. The breakfast area attendant, Adrian gave us some helpful tips for our day at Carlsbad Caverns National Park while we were eating the free breakfast that is available every morning. 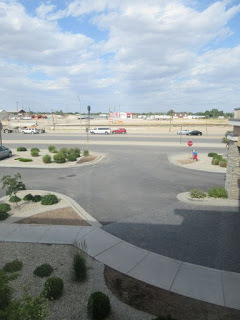 We also liked that the hotel was on the same side of Carlsbad as the national park - so we did not have to drive through much traffic to get to the park. There are restaurants & Walmart nearby making the hotel convenient to necessities. 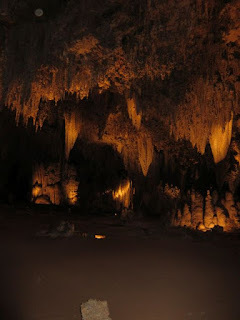 The hotel was a short 30 minute drive to the caverns. 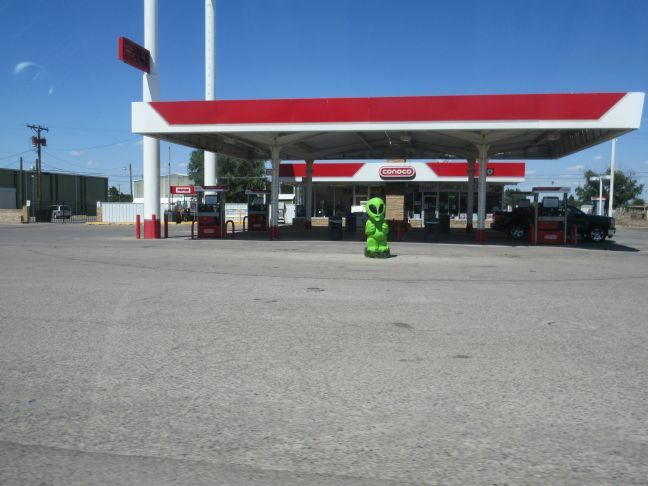 An "alien" sighting in Roswell. 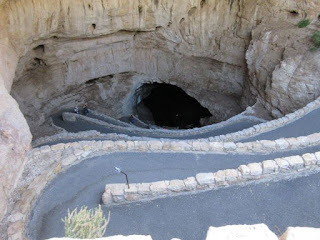 When we left Carlsbad Caverns we drove 2 hours north to Roswell, New Mexico as it was on our way to Red River, NM. Roswell is world renowned for the unidentified flying object that crashed near the town in July of 1947 & the controversy that surrounds it to this day. We were expecting a small town with a few thousand people. 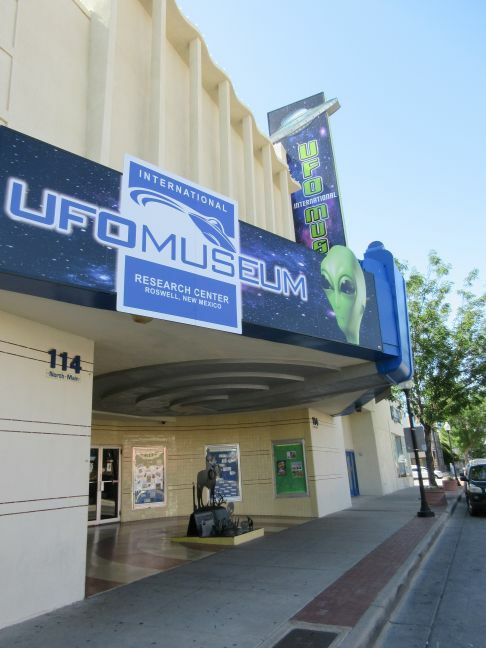 We were surprised to find Roswell to be a decent sized town with a population of 48,000. There are many shops, theaters, restaurants, & hotels to choose. Roswell has embraced their UFO notoriety & you will find "aliens" all over town. The town even has a UFO Festival the first weekend in July! 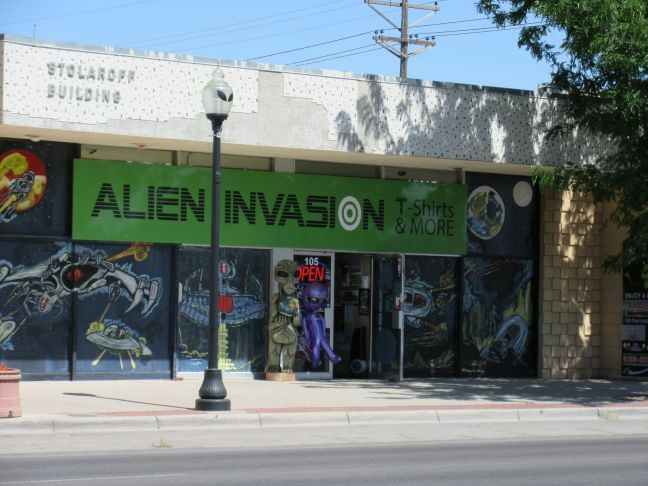 There are "alien" sightings everywhere in Roswell. 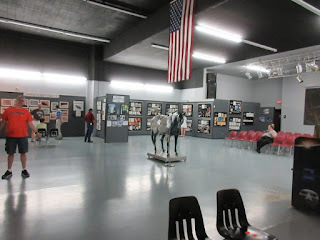 Since we were in Roswell we decided to visit the International UFO Museum. (my son was more excited about it than we were) You can't visit Roswell without doing a little UFO research right? The cost for admission was relatively inexpensive at $5 for adults, $2 for children aged 5-15, & FREE for children 4 & under. Inside the museum you will find many news articles & information about UFO sightings from around the world but the primary focus is the Roswell area. There are also animated displays of aliens & UFOs. They show UFO related movies throughout the day in the movie room. It was fun to go & see what the museum had to offer but I would not plan to spend more than an hour at this location unless you are an avid UFO researcher. Remember how I said I was a member of just about every hotel loyalty program available? Well our night in Roswell was FREE because I cashed in my Marriott loyalty points. Since I was using my points I really did not compare any other hotels prices because how do you beat free? I did research the hotel to make sure I was not getting a bad hotel, I won't stay just anywhere even if it is free. Each morning a FREE breakfast is available. 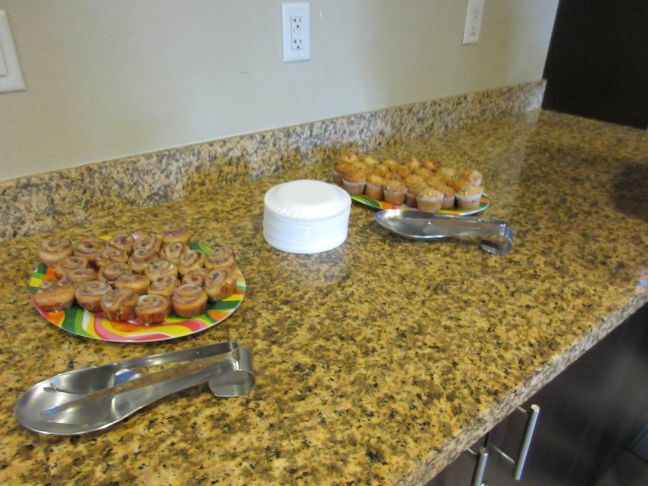 The breakfast included waffles, muffins, bagels, cereal, oatmeal, eggs, sausage, yogurt, fruit, juices, & milk. Everything you need to start your day! 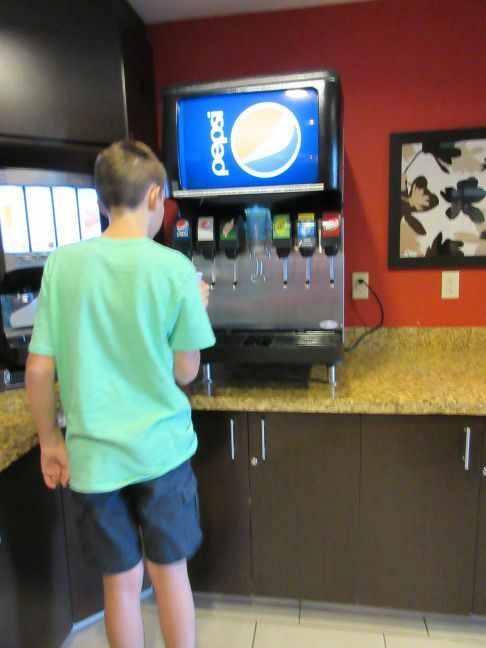 Every afternoon from 4-7 PM snacks & Pepsi soft drinks are available for FREE. The snacks vary by day but the day we were there they offered cinnamon rolls & popcorn. 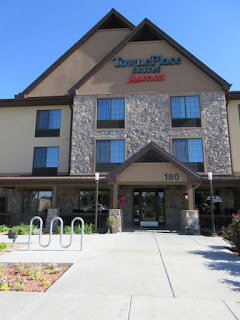 As far as amenities go, TownePlace Suites in Roswell was our favorite hotel on our trip this year. available daily from 4-7 PM. 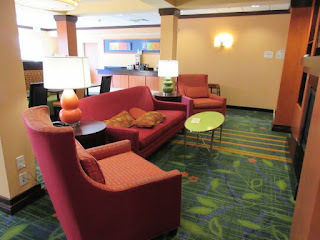 We stayed at TownePlace Suites Roswell & loved our stay! 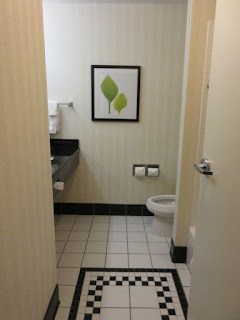 The hotel was impeccably clean & quiet. We really liked the location, about 1 block from Main Street. TownePlace Suites offers many amenities including a heated outdoor pool, a fitness center, on-site laundry facilities, & an outdoor patio & grill. Our room was our very own studio apartment! There was a small kitchen with refrigerator, cook top, sink, & dishwasher. Our room had 2 very comfortable queen beds, an over sized chair, & dining room table. The closets were big, like walk in big. 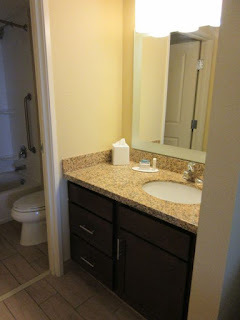 I liked that the bathroom sink was separate from the toilet & shower which makes getting ready easier. We never heard anyone in rooms around or above us making for a great night of sleep. The television in our room was a smart TV where not only did we have access to many channels but we could also sign in to our Netflix account & watch a movie. The WiFi network was amazingly fast and FREE! After a long day of exploring Carlsbad Caverns we went to dinner & then crashed at our room and watched one of our Netflix movies. 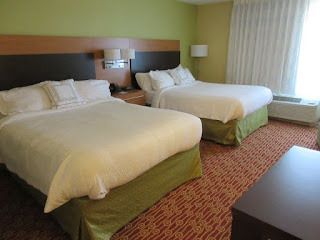 Our room at TownePlace Suites Roswell was a studio double queen. 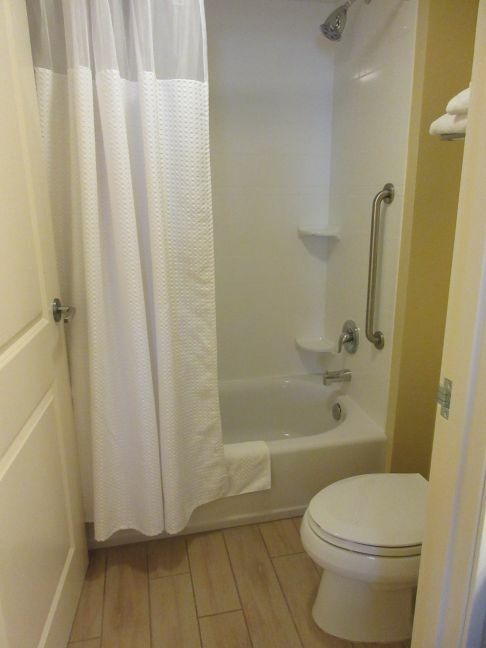 is separate from the toilet/shower. On our visit to Southern New Mexico, our family was able to see & do things we had never done before. After two days we headed for the high country of Red River, New Mexico. Check out our blog on our visit to the beautiful mountains of New Mexico. Wherever you go, may God bless you on your travels.